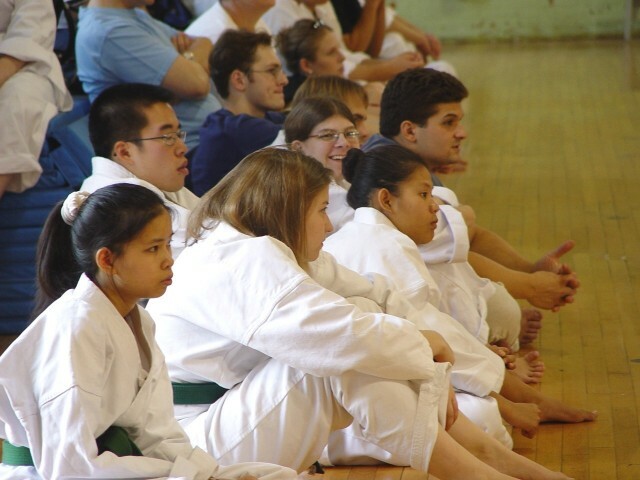 Front: Husky Cup winners Dan Barvenik (Mens Black Belt), Ada Moisescu (Womens Brown Belt), Matt Delude (Mens Brown Belt, Matt is missing but Rim Baltaduonis is watching his cup), Abby Barrera (Green Belt), Eva Forrest (8-7 Kyu White Belt), and Joe Augulis (9th Kyu White Belt). Rear: Phil Capella (kneeling), Shaun Rathbun, Mike Burnham, Joel Garcia, Joe Vincente, Julie Westmoreland, Ryan Jacobs, Ken Forrest, Marius Moisescu, Nicole Dinicola, Bako Bakoledis, Amanda Yarlett, Dan Napier, Lia Burnham, Mike Jacobs, Katy McGrath, John Seifert, Alison Flannery, Kwan Lam (hiding), Chrissy Phalstaf, Lam Wong, Shane Quintard, Melissa Gernat, Eric Chameroy, Val Gorbatyuk, Phuc Thieu, Alissa Stockage, Keri McGrath, Tony Carpanzano, Becky Alberter, Christine Flannery, Laura Landry, Brian Boyce, Tamara Machac, UConn Chief Instructor Bob Jacobs (kneeling), Jude Kessler and Jon Alonso. Tamara Machac (2nd place) and Eric Chameroy (3rd place) face off in the semi-finals of the 8-7 kyu white belt sparring event. Phuc Thieu, Kwan Lam, Chrissy Phalstaf, Christine Flannery, Abby Barrera, Tony Carpanzano and others watch the competition. 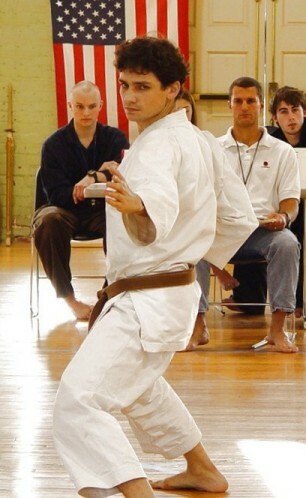 Brown Belt Division Husky Cup winner Matt Delude performs Bassai Dai.